This morning on Facebook I learned that one of the biggest fans of the R33 GT-R, Alexander Gorodji, had suddenly recently passed away. If you haven't read it yet, highly recommended. One of the few books/articles out there that doesn't denigrate the R33, or in fact any of the cars - it's written properly, meaning that it shows how awesome each of the GT-Rs were for their particular era. Written by a true fan of all the cars, I think. Sean Morris also has more information about Mr. Gorodji here. Rest In Peace, fellow R33 Otaku. Wish support for his family. 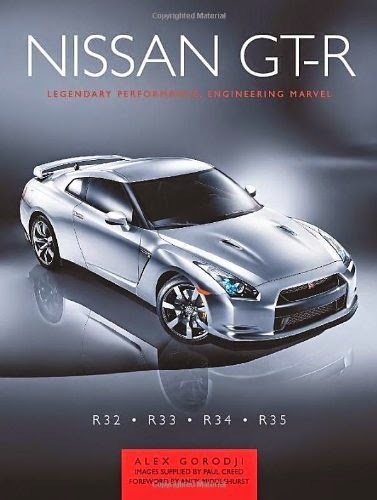 Of the 3 big english GTR books, this one is definitifly the best one. At least for me. Yeah I have that book, and can recommend it, particularly how it explains the attesa e-ts system and HICAS, it provides a good base level of knowledge. Ibo Nibo, what would the other 2 big english GTR books be? But now after glanzing again over the books, I think the book I most enjoyed was Andy Butler's one, followed very closely by Alex Gorodji. The last place goes to Born to race, which still is a nice book, but doesn't come close to the 2 others. Ibo and Aquila, thanks for the posts and comments as always! Notice the instrumentation - if the car is a real TK car, there is absolutely no reason to switch out the gauges for Nismo ones. All the mods you list are pretty much what most people do to their R33s. you can try to order a new blue plate (which, if removed, I would be very suspicious of - why remove unless it's hide a car that's been stolen?) but Nissan in Japan would have you prove you owned the car BEFORE the plate was lost. As for TommyKaira, the company from back then I believe was reorganized so it's probably not the same company now. There are many more knowledgable people than me, you should join the Facebook page and start asking questions. Good luck!